My monitor/subwoofer system | What's Best Audio and Video Forum. The Best High End Audio Forum on the planet! Already my last speakers, the Reference 3A MM DeCapo BE, were a little big to be called "minimonitors", and the current ones certainly are, given the substantial depth of the cabinet (see image below). Therefore I adjusted the title for this thread. My system now features several major upgrades which I will discuss below. The CD transport, digital cable, power amp, subwoofers, ASC TubeTraps, SubTrap and sound panels, as well as Shunyata Dark Field v2 cable elevators were purchased at Goodwin's High End, my trusted dealer for a number of years now. The other gear was purchased through direct sales on the web; the ZenWave Audio D4 interconnects (see link for my review) and ZenWave Audio SMSG speaker cables were manufactured by WBF member DaveC. These are the top-of-line monitors by Reference 3A. Since hearing Ian's (Madfloyd's) Magico M Project speakers, I always wanted to have speakers with a fully inert cabinet for high resolution and timbral as well as transient accuracy, sound features that can become compromised by blurring cabinet resonances. These Reference 3A speakers offer an inert cabinet, achieved by elaborate and sophisticated construction, at a great price in high end terms. They also come from a company and designer (Tash Goka) whom I already trusted, given how much I liked my previous monitors from Reference 3A, which also are a crossover-less design. With high-resolution monitors I wanted to have bass of high resolution as well. Ian recommended JL Audio subwoofers, and I went with this recommendation, which turned out to be an excellent one. It was also supported by a string of believably positive reviews. The model is Fathom 112 v2, and I bought two of them to energize the room more evenly (they replaced a single REL Storm III sub). My old amps, Audio Innovations Second Audio parallel push-pull triode monoblocks (15 W/ch) had served me for 26 years, while they went through a number of modifications and supplementation with external BorderPatrol power supplies during that time. They played well on all kinds of music, but I wanted more effortlessness on orchestral music, so I was looking for alternatives that could deliver higher power. I ended up with an Octave RE 320 stereo amp (plus Super Black Box) that Paul from Goodwin's High End graciously lent me two times for several days each to audition at home, which is the best place to evaluate. To my ears, this amp offers an expanded, realistically colorful tonal palette as well as great high-frequency extension, and also excels in resolution of timbre, separation of instruments, and speed and accuracy of transients, thus competently driving the capabilities of my monitor/sub combo. It also wisely offers protective shut-down circuitry in the event of tube failure. The greater effortlessness on orchestral music was also made possible in an unexpected but crucial manner by the upgrade of speaker cables, from Monster Sigma 2000 to ZenWave Audio SMSG. These new cables also increased resolution even further (I already had had a shorter pair for my old monoblocks, and now traded it in for a longer run for the stereo amp). Well if it sounds half as good as it looks you are set! Really beautifully done Al. Power - Torus 75 amp WMT. Furutech NCF Lines, Flux-50s, Outlets, PC's. Star ground. Cables - Nordost Valhalla 2 and Odin (phono). Analog Source- ARC Ref 10 Phono. Acoustic Sig Ascona MKII, TA-9000 arm, Lyra Atlas. Digital Source- MSB Reference DAC, Femto 33. Amplification - Soulution 721 Pre and 501 Monos. Room Acoustics - Acoustic Frontiers Design, RPG Plates, Absorption and Diffraction, and Custom Helmholtz Traps. Stands - Solid Walnut by Timber Nation. Al invited me over to hear his updated system last week. Holy walloping dynamics Batman! I don't think I've ever heard such explosive drum whacks. After one song I ran out of the house looking for raiding war parties to join. The drums sounded like thunder in three dimensions. Art Blakey was insane - best I've ever heard. The system is much cleaner than his earlier iterations I've heard, but it still retains the warm phat sound from the bigger horns that I've always loved. I thought the sound was detailed while still remaining smooth - for the most part. The system may provide a little extra sparkle somewhere between the 3 kHz to 10 kHz range, because trumpets and snare drums really crack through the mix in a very exuberant manner. It is a very lively and dynamic sound; a system which says "you will sit up strait and pay attention!" I think I walked out with a considerably higher heart rate than when I arrived. Al was very kind to adjust the way the subs were blending into the mains to fit my listening preferences. I think it had the effect of increasing the perception of depth at the sweet spot. At first I found the overall presentation a little too forward, and the adjustment of the subs moved the presentation back a bit to what I have grown comfortable with at home. I am finding the psycho-acoustics of frequency response very interesting these days. Small broad band changes in certain regions can change the overall feel a considerable amount. The system is extremely impressive sounding. As I generally look to music when it is time to relax, I am not sure I could handle such excitement on a daily basis. My system is warm milk. Al's system is a high quality double Espresso. This is the kind of system I would really like to hear! Looks like it should be able to really light the room up and be just amazing sounding. Well done, Al!! What are your impressions of the Octave amp with the KT150's? Thanks, Alan, for your report, which was a great and fun read. I still chuckle about the 'raiding war parties'. The piece that elicited that must have been the one with six percussionists and choir (last part of Rihm's Tutuguri) with the large snare drums and the thunder of the heavy bass drums. The Art Blakey you referred to was the famous 7-minute solo "Freedom Rider". I feel flattered about the comments coming from you, who is a drummer himself. The little extra sparkle on trumpets and snare drums may still be there, but it may also have been tamed by further break-in -- 6 days before you came my treble was suddenly so hot, and I mean really HOT, that most people would have run out of the room within 10 seconds. When you came it was already very much settled down, and may now have settled even further. I also made some acoustic changes for the better in the meantime. You'll be the judge next time you come to listen. In any case, officially the amp is still not fully broken in -- Octave states that it takes about 300 hours to sound best. As for the subwoofer setting, I really start to like the steep 24 dB/octave roll-off that you prefer. It sounds more accurate on a lot of material than the shallower 12 dB/octave roll-off. I now prefer it on the drum tracks that we listened to, and also on rock as well as jazz, and on piano. It just took some getting used to, since my REL had a clearly shallower roll-off. On orchestral music and cello the 12 dB/octave roll-off adds some extra body, but for my own listening I usually prefer on that music the 24 dB/octave setting as well. Thanks for the suggestion! Thanks, Paul and Davey, for the compliments. Davey, I really like the Octave with the KT150 tubes. I've made some comments on it in my opening post. I can imagine how you must be thrilled with your Jadis monoblocks that have the same tubes. I was originally a bit skeptical about the class A/B pentode circuitry of the Octave amp, but that skepticism quickly settled once I auditioned it. Al, I really feel the KT150's are a game changer. Having owned tube amps with KT88's. 6550's, EL34's, and a host of other power tubes, I think the KT150's offer one thing that really distances them from the competition ( at least in all of the amps that I have heard them in)--- and that thing is exactly what you stated....increased resolution across the full audio spectrum. Indeed, I am extremely pleased with my Jadis amps utilizing these tubes, they are the most revealing tube amps that I have ever heard. Even though the Jadis runs in Pure Class A, I doubt that is what is going to make the difference vs. the KT150's; which is why i totally understand your feelings towards a class AB amp...and then being very pleased with it. Congratulations, Al! Everything looks great! Al, I commend you for taking the time and making the effort to post this new thread about your system. Those new speakers are monitors indeed. The opening post, and photographs that follow, should serve as a template for others on how to share one's system on a public forum. These are my favorite kinds of threads. I appreciate the list of gear, the brief explanations about the changes, and the fantastic photographs. They really capture the look and feel of your system. I particularly like the first photograph which shows the whole front of the room including the listening chair. It captures well the environment in which you enjoy your music. The only suggestions I would make is to list in the opening post some of the music and recordings you like. That would provide further context. I really enjoyed reading Alan's comments. He has a writer's gift, and that iconic photograph kind of says it all. Through these recent upgrades, your system has been transformed. When I first heard it years ago, I was struck by the sheer scale that your small speakers produced in your fantastic room. The imaging, soundstage, dynamics and effortlessness all set a standard for me. Most impressive was the sense of liveliness, and PRESENCE. The former system did so much right, that the few areas in which it did not excel, namely resolution and tone, could be easily overlooked because they did not distract from the overall musical message and emotional involvement with the music. I think the last couple of years of listening to Madfloyd's system with his incredible Magico M Project speakers has shown both of us how resolution, tone and coherence can take a system further. You have learned those lessons well, and the current iteration of your system demonstrates it. You have retained all of the positive characteristics of the last system and added resolution and a more accurate portrayal of tone and timbre to make your system sound much more complete and convincing. It is now an utter joy to listen to and I am sure it would surprise many people who underestimate the potential of a two way stand mount and sub woofer based system. Your joy and excitement, and perhaps pride, are evident whenever I now sit down and listen to music with you. Your giddiness and smile say it all. Congratulations on your focused efforts to take your system to a new level of extraordinary musical involvement and emotional satisfaction. I am very happy for you and look forward to many more shared listening sessions. Bring on the Stockhausen, and fasten your seat belt! Thank you, Peter, for your kind words about the sound of my system, and for taking us on a, for me quite recognizable, journey through the progress of my system over the years. As for tone and timbral resolution, your system also has served as a model for me since we have known each other. Congratulations, intrigued and love the look of the new set up Al. The Reflektors look fairly beefy and like they mean business. I have thought about these and also the Nefes perhaps with a 50 watt SET or even Cat or Jadis amps. Best wishes with them... looking forward to your updates as it all develops. have stated that they are practically full range and don't need subs. I haven't had that much luck. It will depend on the room. If you have concrete walls, and the speakers are fairly close to the front wall, then perhaps the bass is sufficient for all purposes. In my case bass support by subwoofer is mandatory for a majority of recordings; I have a wooden house, and the driver plane of the speakers is 7 feet from the front wall. I prefer that distance for optimal soundstage, and also for energizing the particular acoustics of my room *). But at that distance it really works very well in the room. I was just listening to music for soprano sax and electric jazz guitar (more of a plucking sound) and was marveling how, at no excessive loudness, the sound from just these two instruments fully energized the room at the listening position (distance tweeter to ear of 9 feet), greatly adding to a 'live feel'. A 50 Watt/ch SET amp is plenty of power to drive these speakers. They could even be driven very dynamically with my old amps of just 15 W/ch. However, my new amp (100/130 W/ch into 8/4 Ohms; the speakers are 8 Ohm) gives an even more dynamic, and also more effortless sound. Thanks for that Al. I also tend to like speakers out into the room rather than using the boundary for bass reinforcement though in the end it’s about whatever is most coherent that I’ll invariably go for... I am a bit of a (read absolute) coherence junkie. I imagine with a crossoverless two way coherence might be quite a bit of a possibility. I am just replacing some Harbeth 30.1s from my living room system and am caught between going for Harby 40.2s (which I had here for a while) or going something like the Reflectors that makes also SET more of an option. For bass extension the 40.2s made the cello sound just more bodied and visceral than the 30.1s and also made the left hand of the piano seem sufficiently weighty and appropriately balanced but the 30.1s just had a coherence and immediacy on their side. You go to concerts and listen to a similarly diverse range of music from memory so if you were playing piano or cello chamber or concerto music would the Reflectors portray these instruments well minus the subs. I’d just love to not go subs though as I am trying to not make a second dedicated listening space (I already have one of these upstairs) out of what is really a room dedicated for living. Want want want, the curse of the audiophile. I figure if the bass of the Reflectors was just a wee bit more extended than the 30.1s I could well be in my two way happy place with bass. The other thing is dance factor. The 30.1s especially had this magic in spades and have irresistible dance-ability. It’s soul and rhythm, more fluid than thump and just a bit like quicksilver. Groove factor is another quality that is a bit of a thing on the checklist. Not every speaker makes you just want to dance when the music is right. Would you figure the Reflectors might have an irresistibly alive rhythm quality. Thanks in advance for any thoughts. 2) A high end system should do at least the following two things to even be worth my time: a) do no egregious harm (that does not imply no limitations, but it does imply no significant distortions); and b) do human voices really well. There is nothing offensive about Al's new system unless you throw really torturous material at it like a huge symphony; and I ran out of time before assessing voices. 5) It is a highly resolving system, much more than the previous one, with a lot of treble energy as in real music, presence and articulation. The resolution does drop as the signal gets more complex, but with small ensembles, drums, and similar the system really shines - Wow factor indeed, with great timbral accuracy. It is, in fact, the highest resolving monitor system I have heard to date, often offering frightening levels of realism. It so often sounded oh so right! To do that, adjusting the subwoofers for the program was necessary. 7) I did hear a slight rounding of the leading edge, which had me searching up the amps' measurements online, and did find the previous model's Stereophile review which does show that slight rise delay. Unlike the predecessor amp's slight ringing after the rise event in the same measurement, this amp did not sound to me like there was ringing; I felt that, if it were to be measured, it would show a slight rounding of the leading edge, post-rise, as well as that ever so slight rise delay. Having said that, it never bothered me a single bit. 10) The first comment I made to Al was that the system is really musical; that did not change over the course of many hours. Great stuff. 11) The drum demo, as aljordan said, was really fantastic. This system has life! Bravo! And thanks again for the real treat Al! 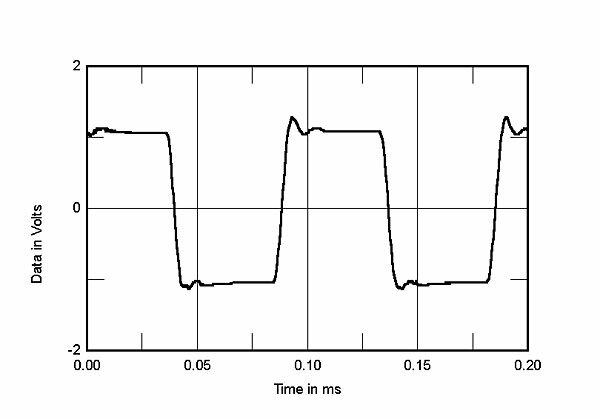 For reference, here's the squarewave response from the older Octave RE 290 amp, from https://www.stereophile.com/content/octave-audio-re-290-power-amplifier-measurements, where the rise delay is only 0.02 milliseconds long (20 microseconds), and whatever it is in the 320, it is still audible to me. I would be curious to see what Stereophile measures, if it ever gets to review the 320. Perhaps I was hearing a combined delay between the amps and speakers ?!?? Thank you, Ack, for your kind words, and I am glad you enjoyed the system so much. It was a fun afternoon! You found the system often to be 'offering frightening levels of realism'. I am not so sure about that, but I am pleased with this nonetheless . You made some very good observations, including the vibrations of the cabinet of the JL subs, which indeed should not be there. The torture test of Mahler's 2nd Symphony with the final choir blasted loud did indeed sound quite torturous, even though I think you said the system did not totally fall apart, which apparently was a positive compared to some other systems (I still didn't like what I heard ). I look forward to hear this on your system. My system fares much better on something large-scale purely instrumental, like Bruckner Symphony 9 or Shostakovich Symphony 4, as long as peaks do not exceed ca. 95-97 dBa (around 100 dB). I am just replacing some Harbeth 30.1s from my living room system and am caught between going for Harby 40.2s (which I had here for a while) or going something like the Reflektors that makes also SET more of an option. For bass extension the 40.2s made the cello sound just more bodied and visceral than the 30.1s and also made the left hand of the piano seem sufficiently weighty and appropriately balanced but the 30.1s just had a coherence and immediacy on their side. I’d love to not go subs though as I am trying to not make a second dedicated listening space (I already have one of these upstairs) out of what is really a room dedicated for living. Want want want, the curse of the audiophile. I figure if the bass of the Reflektors was just a wee bit more extended than the 30.1s I could well be in my two way happy place with bass. The other thing is the dance factor. The 30.1s especially had this magic in spades and have irresistible dance-ability. It’s soul and rhythm, more fluid than thump and just a bit like quicksilver. Groove factor is another quality that is a bit of a thing on the checklist. Not every speaker makes you just want to dance when the music is right. Some speakers sound amazing but don’t make you want to move so much... physically involving sound in a living room can be a really good thing. Would you figure the Reflektors might have an irresistibly alive rhythm quality. As also Ack pointed out, the speakers are capable of great rhythm and liveliness. Let me also make a plug for the Schiit Yggdrasil DAC in this regard, since everything starts at the source. While early digital had been severely handicapped in terms of rhythm, it has come a long way, and I perceive the Yggdrasil DAC to be one of the best rhythmic performers that I have heard, regardless if digital or analog. Very dance-able too!